Essa Moosa, who had been diagnosed with cancer a while ago, passed away on Sunday. He had turned 81 on February 8. RYLAND FISHER pays tribute to the celebrated struggle lawyer. When my former colleague Mansoor Jaffer and I visited judge Essa Moosa at his house in Crawford last week, an old schoolfriend of Moosa asked us whether we were his sons. We replied: “Yes” because in many ways we were. Moosa had that effect on people. He was much more than a lawyer. He was also a comrade and friend to many people all over the Western Cape and South Africa. This was evident at his funeral service on Sunday afternoon. Moosa, who had been diagnosed with cancer a while ago, had passed away at 11:15 on Sunday. He had turned 81 on February 8. In keeping with Muslim tradition, his funeral was held on the same day. The funeral was set down for 16:00 but, from the minute word spread that he had passed away, hundreds of mourners made their way to 12 Rokeby Road, Crawford, an unassuming facebrick house that Moosa and his wife Fatima had called home for many decades. It was difficult to know who was there because there are no VIPs at Muslim funerals, just mourners, and one had to scour the crowds to see if you knew anyone. But those who were there represented the diversity that Moosa always embraced. They included former Finance Minister Trevor Manuel, former Premier and Ambassador Ebrahim Rasool and his former political nemesis Mcebisi Skhwatsha, who is now a deputy minister, another former Ambassador, Franklin Sonn, businessmen such as AK Peer, Anwah Nagia and Patrick Parring, ANC provincial leaders Faiz Jacobs and Cameron Dugmore, senior Roman Catholic priest, Father Peter John Pearson, senior members of the Hawks, with whom Moosa had worked closely in his later years, senior members of the police, and a host of lawyers who had worked with and for Moosa over the years, including Bash Wagley, now the Judge President of the Labour Court, Ebrahim Mohamed, now the National Consumer Commissioner, and Judge Vincent Saldanha, who has acted with Moosa on the Cape Bench. Outside the house, at the mosque and at the graveside, it was like a reunion of old comrades, many of whom had not seen each other for years. Moosa and former Justice Minister Dullah Omar were known as “the struggle lawyers”. Many comrades shared stories about how one of the first things they learnt in struggle was Essa Moosa’s number, with an instruction to “phone Essa” whenever they were in trouble. At the graveside at Mowbray Muslim cemetery, in the shadow of Table Mountain and right next to Groote Schuur Hospital, a former comrade from Paarl came up to Mohamed to thank him for helping him and other comrades from Paarl in the struggle years. My association with Moosa began in the early 1980s when I worked as a volunteer – and later full-time – with an anti-apartheid community newspaper called Grassroots. Moosa was our lawyer but also chaired the paper’s board. The paper was in trouble often but I suspect that Moosa did not make any money out of being involved with the paper. He did not get involved in community work in order to make money. Moosa was also involved in South newspaper, where I worked in the latter part of the 1980s. Like Grassroots, South was vehemently anti-apartheid, but tried to operate on a commercial basis. Our association continued over the years, mainly through Moosa trying to convince me to support various initiatives about which he felt passionate, including trying to get a pardon for Allan Boesak and garnering support for the cause of the Kurdish people, something that took up a lot of his free time in recent years. Moosa also spent some time on the board of the community radio station, Bush Radio. Gadija Vallie, who worked with E Moosa and Associates in various capacities and remained a close friend of Moosa, said after the funeral, as mourners ate mutton breyani and drank fizzy drinks, that a giant had fallen. Looking at Moosa’s CV, it was clear that he was everywhere. He started work as a bookkeeper at Woolworths after matriculating at Athlone High School in 1954. He began studying law at the University of Cape Town in 1957 and graduated in 1960. He then worked as a legal assistant at various firms before working for himself in District Six in 1966 until he was forcibly removed from the area in 1969, when it was declared white. Moosa tried to challenge the proclamation of District Six as a white area in court. 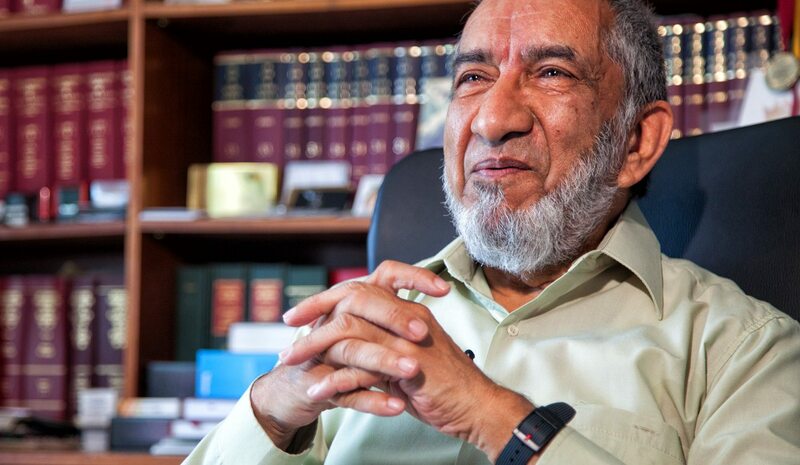 He finally started his law firm, E Moosa and Associates, in Athlone in 1979. The firm inadvertently became involved in several high-profile and not so high-profile political cases throughout the 1980s. Most political activists in the Western Cape had some kind of association with the firm and with Moosa himself. The firm became known for their work with political detainees and human rights in general. At that time, Moosa was also involved in forming the National Association of Democratic Lawyers (Nadel) which sought to unite lawyers on the basis of their opposition to apartheid and not on the basis of race, which many other organisations did. In the late 1990s, after a short stint in the Department of Justice, Moosa was appointed a judge in the Cape Hight Court. His appointment was the first time that a lawyer, as opposed to an advocate, was appointed as a judge. After his retirement in 2011, Moosa was appointed to head up a unit that would investigate complaints against members of the Hawks, formally known as the Directorate for Priority Crimes Investigation. Moosa fell ill a few weeks ago and was discharged from hospital a week before he passed away. The doctors told his family that there was nothing more that they could do for him.